The Americana edition of the Timeline series focuses heavily on popular culture. While the cards span 500 years (from 1507 to 2011), removing just 4 cards condenses the timeframe covered by Americana to a measly 200 years. This may be the most densely-populated of the series. While loosely centered on happenings that effect America, a majority of the events depicted on the cards have a broader reach. The death of Michael Jackson… publication of For Whom the Bell Tolls… the founding of Microsoft. There is a very heavy focus on popular movies, literature and art that have touched modern life in some way, making this an easy-to-relate-to Timeline set. From the first Stetson hat to the unveiling of the first iPad, America’s history and its popular culture have gone hand in hand. See if you can remember when the Red Sox traded Babe Ruth, or when Lindbergh crossed the Atlantic. American popular history was never this much fun! Timeline: Americana takes the players through a historical tour of the popular history of the country. Each player has a hand of cards, and they take turns placing those cards correctly into the growing timeline. Guess correctly to get rid of all your cards and win the game! Brilliant art by industry-leading talent. The seventh in the wildly popular Timeline series. 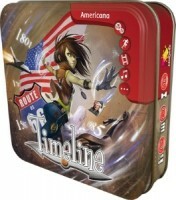 Add a Review for "Timeline: Americana"